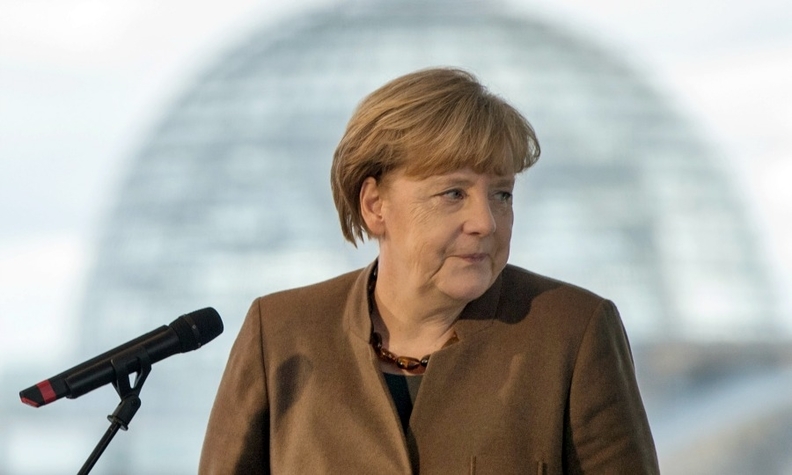 Angela Merkel still faces political fallout from both the VW scandal and the refugee crisis. NEW YORK (Bloomberg) -- As Angela Merkel celebrates her 10-year anniversary in office, the German Chancellor faces two crises. While the political fallout is still uncertain, in economic terms the positive impetus from an influx of refugees is due to more than offset the negative effect of the Volkswagen Group emissions-cheating scandal. The expected absorption of about 800,000 asylum seekers into Germany, many fleeing the violence in Syria, will add 0.2 of a percentage point to annual growth next year, according to the median estimate in a Bloomberg survey of 24 economists, conducted from November 6 to November 13. The VW scandal's impact will be negligible, lowering 2016 growth by just 0.03 of a percentage point. Based on the IMF's October estimate of nominal German gross domestic product, the combined impact translates into roughly $6 billion in extra economic activity next year. "The public sector directly demands more goods and services to deal with the influx of refugees and the refugees themselves boost private demand as they also spend money in Germany," said Stefan Kipar, an economist at Bayerische Landesbank in Munich. "To sum up, the refugee influx has effects comparable to an unplanned economic stimulus program in the short run." The increased demands on public coffers to house and feed hundreds of thousands of refugees, however, means a planned budget surplus for 2016 has evaporated, according to several economists who participated in the Bloomberg survey. The VW scandal's impact is slightly harder to predict, but could also have positive elements. "Note that repairs are positive for GDP growth, and that demand domestic or foreign that turns away from VW may shift to other German producers, thus being neutral for German GDP," said Timo Klein, an economist at IHS Economics in Frankfurt. This comes amid an apparent plateau in Germany's recovery, with the economy forecast to expand 1.7 percent year-over-year in the fourth quarter and less than 2 percent annually through 2017, according to a separate Bloomberg survey. While the economics of Germany's refugee dilemma are straightforward enough, the politics are anything but, with growing demands throughout the country and even within Merkel's own coalition to curb migration in the wake of the deadly Paris terrorist attacks.